Every morning I wake up and go outside to visit my bees. Same when I come home. The girls are doing well, enjoying their time without rain. I find myself walking through the yard noticing everything that flies, and taking particular note of the plants and shrubs that girls are buzzing around. 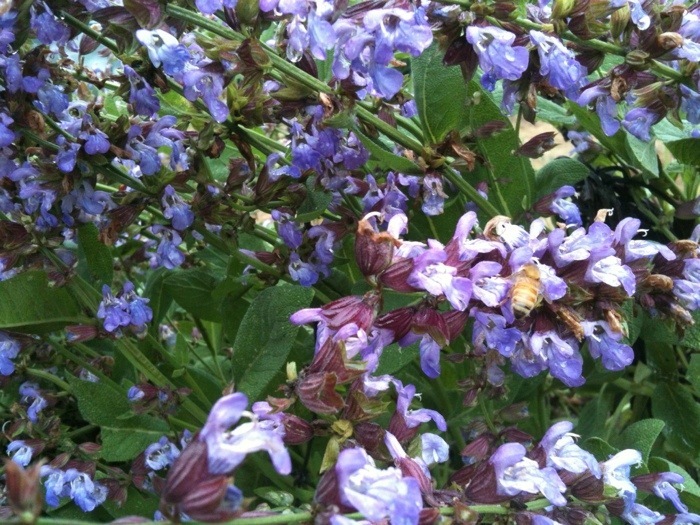 Right now we have large purple blossoms on our sage. However, the bumble bees spend more time around the sage than our honey bees. Something I never would have noticed before. And the evergreens have small white flowers that keep the girls buzzing. They especially like the blossoming bushes that line the back of our yard. I never noticed those before either. I’m grateful that we picked such a good location for the hives. Facing the garden and surrounded by blossoming bushes, veggies and flowers. Lots of foraging going on. We’re hoping for a good veggie crop this year with all of the free pollination. More rain tomorrow. The girls will be disappointed but the garden will be happy.